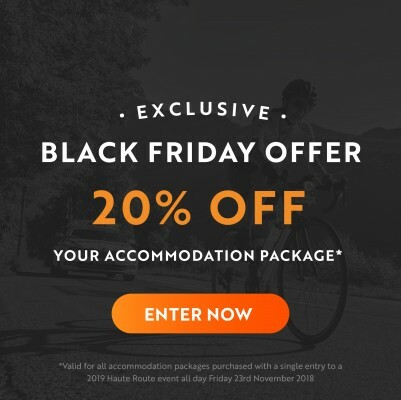 Get 20% off any accommodation package you purchase at the same time as a single entry for a 2019 Haute Route event on Black Friday! Purchase an entry to any 2019 Haute Route event on Friday 23rd of November 2018 and get 20% off any Accommodation package purchased at the same time. Experience the premium Haute Route experience in 2019 by choosing a package amongst our varied accommodation offerings. Let us look after booking your hotel near the rider services and start line, so that you can make the most of your Haute Route experience. NB: The offer is also valid for riders having already purchased an entry to a 2019 event but haven’t yet purchased their accommodation package. Those concerned can return to their registration form, select their accommodation package and proceed to checkout to benefit from the offer.